Easter Vigil Sermon ~ April 4, 2015 – Rev. Canon Dr. William J. Danaher Jr. Please let me begin by saying a compliment. As I was going through the service and keeping one eye open to our reading of all the marvelous works of God, another part of me was watching Mia and John and Dominic and thinking, “these babies are being so good.” And they really are. No matter what happens tonight – there might be a little bit of commotion when they’re getting baptized – please know that there is no way in which their behavior will bother us. In the 5th century, Augustine believed that babies cried when they were being baptized because they were full of the devil. I’m pleased to let you know that we have developed a more generous theology since then. We believe that they’re crying because they are a little uncomfortable. In fact, their tears and discomfort will be a blessing. They remind us that baptism, particularly on this night, marks a critical transition. Everything we are doing serves to heighten the tension in this transition. We have entered in darkness, and I’m talking to you while I’m holding onto a candle. To an outsider, it might seem like I am about to tell a ghost story rather than do some kind of rite. But in fact, what we’re doing is profoundly important. When we go through these motions we actually enter space that existed since at least the 4th century. We are celebrating the world’s movement from death to life, from sin to salvation, from brokenness to wholeness, from woundedness to healing because of who Jesus is as God and man. This movement pivots around baptism, because baptism is the moment in which we turn away from the power of sin, evil and death, and turn toward the power of life, God and salvation. We dedicate ourselves to the forces that bring this goodness into the world. We align ourselves with whatever brings God into the world, whatever brings life into the world, whatever brings salvation into the world, and that is what Christians would call “perfect justice”. Even though Mia and John probably won’t remember (I suspect that Dominic is going to remember because he’s a big boy) what is happening, it does not really matter. Because what’s powerful about baptism is not what we say to God. It’s what God says to us: We have been claimed by God. We have been given to God. Our life is now bound up in the life of God, and that’s a great blessing. And that’s something that none of us ever deserves or, frankly, understands. It’s a truth that is so deep that we spend the rest of our lives trying to understand our connection with God. For six years I lived in Tennessee, and I loved to read the messages posted on the signs outside of churches. I made a kind of small hobby out of watching these church signs and commenting on them in my mind. Sometimes they were wonderful, sometimes not so wonderful. One time, during Easter, I saw a sign that said “He ain’t here.” I thought, “What? Am I missing something?” I thought that Jesus’ resurrection meant that he was here – vividly here. But then I realized that this sign made the most profound and powerful statement about Easter that I’ve ever read. With these words, Mark conveyed a very profound point: Jesus is no longer among the dead. All of us are bound to this world and all of us will die. Jesus is not here. Jesus is with the living now. His body has been raised, and he has ascended, and he is seated at the right hand of God. 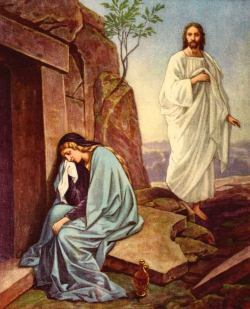 He is not here, and that is good news, because he has risen. He is not here, but he is present. Because the power of that resurrection for us means that we have new life in Christ. The power of that resurrection for us is that now we meet Christ in each other, and we meet Christ in our friends and strangers. We meet Christ when we look in the mirror. We see ourselves beloved of God, chosen by God, part of God’s body which means we are joined to Christ through grace. All of this is bound up in Easter. All of this is bound up in the Resurrection. All of this is bound up in baptism because in baptism we are buried with Christ so that we are raised with him. We are part of his body. That is what baptism means. To be a Christian is to take part in a kind of embodied community, meeting Christ in the body of Christ on the altar, meeting Christ in the mystical body of Christ that is the church. And that’s good news because when Christ is present, life is present. When Christ is present, salvation is present. When Christ is present, healing is present. So he ain’t here. But he is present. Let us bless the Lord.